For Doug, life is all about HORSES. Doug Walters is a proud life-long Michigan resident born and raised in Perry, MI. Doug comes from Horse people, you could say he’s been riding horses his whole life… and then some thanks to his rodeo queen mother. 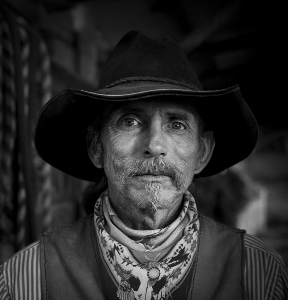 100% Bon-a-fide Cowboy Doug has done everything from riding bucking broncos to testifying in court as a horse expert. Doug moved to the Greater Traverse City over 30 years ago and started Outrider Horseback Riding in 1998. With the help of his brother, Dennis, he’s been leading trail rides ever since. Doug and Dennis maintain a good old fashion farm complete with chickens, pigs, cows, dogs, and of course, a barn cat. He was possibly born in the wrong era, but that just makes riding at Outrider that much more Authentic.